Everyone wants to own their own island and with our Lighthouse Island pin you can. This unique pin can light the way for yourself or someone you love. This Lighthouse Island pin makes the perfect gift for that adventurer at heart or a special treat for yourself. This pin comes in a silver finish with transparent emerald green epoxy grass and transparent beautiful turquoise blue epoxy water. 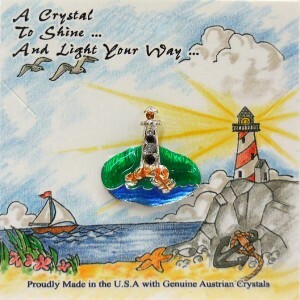 The lighthouse is made with Genuine Austrian Crystal stones with a Crystal stone light on the top. A “To and From” is printed on the back of each card so you can sign and address this special gift for that special someone.